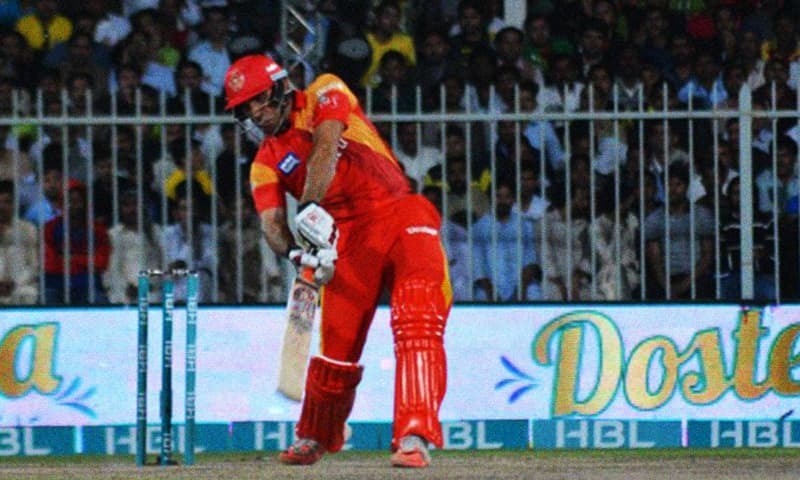 Islamabad United beat Karachi Kings by five wickets in the 16th match of the Pakistan Super League (PSL) at the Sharjah Cricket Stadium on Sunday. United skipper Misbah-ul-Haq (38) established a crucial 63-run stand for the fourth wicket with Khalid Latif (33) to recover his side after losing three early wickets. At one stage, United were 19-3 in 3.2 overs as Sharjeel Khan (one), Andre Russell (14) and Brad Haddin (four) were sent back to the pavilion by Kings’ pace spearheads Mohammad Amir and Sohail Khan. But Misbah’s stand with Khalid set the tone for Faisalabad-born Asif Ali, who with the help of one four and three sixes, smashed a quickfire 31 off 17 balls to take United home. For Kings, Sohail Khan was the pick of the bowlers with figures 4-0-23-2, followed by Mohammad Amir 4-1-21-1. The England international Ravi Bopara also chipped in by dismissing the United skipper Misbah-ul-Haq. Earlier, Islamabad United put up a disciplined bowling display as they successfully stopped Karachi Kings from posting a big total. Kings managed to score 128-5 in their 20 overs, courtesy some tight bowling by Imran Khalid who ended by with figures 4-0-19-2 and was declared the Man of the Match. Left-arm spinner Khalid and seasoned all-rounder Azhar Mahmood shared three wickets among themselves and bowled economically to the Kings’ batters. Mohammad Sami and Andre Russell also took a wicket each. For Karachi, Bopara and Mushfiqur Raheem stood out with 45 and 33 runs respectively but lost their wickets before they could hit the pedal in death overs. Debutant Shahzaib Hasan shined for Kings, smashing a 19-ball 27 with three fours and one six. United had won the toss and elected to field first. Left-arm pace sensation Amir returned for Kings after missing last two outings. United, on the other hand, who were without the services of Australian all-rounder Shane Watson, brought in former Pakistan all-rounder Mahmood. Shoaib Malik (captain), James Vince, Shahzaib Hasan, Imad Wasim, Ravi Bopara, Shakib Al Hasan, Mushfiqur Rahim (wicketkeeper), Mohammad Amir, Usama Mir, Sohail Khan and Mir Hamza. Misbah-ul-Haq (captain), Sharjeel Khan, Khalid Latif, Asif Ali, BJ Haddin (wicketkeeper), Azhar Mahmood, Andre Russell, Samuel Badree, Imran Khalid, Mohammad Sami and Rumman Raees.